Link up your COYER reviews here. Every couple of months Michelle @ Because Reading and I take a look at our very long To Be Read shelves and select a book that we both want to read. And then we read it and chat about it. We’ve changed it up a bit to make it simpler. Instead of a lengthy chat, we’re interviewing each other on our respective blogs and asking – Was it good for you? Michelle and I chose to do Hope’s Reign by Selena Fenech for this because we both read and loved the first book in the series Memory’s Wake. We figured we’d finally have one where we agreed on the book. We weren’t so lucky. As you may have noticed from my review yesterday, I gave Hope’s Reign 4 stars, while Michelle barely gave it 3 stars. She would have DNFed the book if I hadn’t told her it got better. So let’s see why she didn’t agree, shall we? I know I want to know! Note: This is the second book in the series, so there are some series spoilers to follow. Let’s start with the good stuff, shall we? What did you like most about Memory’s Wake and why were you eager to read Hope’s Reign? The characters were my favorite part in the first one and I loved the story, so I was looking forward to reading Hope’s Reign. The end of the first one left you with so many questions I wanted to see where it took the characters next. I agree I love this characters and it was hard at first for me because I didn’t remember them very well. So we already know that Hope’s Reign didn’t live up to your expectations. Do you think that the big time gap between reading it and Memory’s Wake was part of the problem? How long was it between reading the books? I think I read the first one last year but the gap didn’t bother me as much, I tend to remember stuff as I read and this book was good a reminding what happened along the way. I also tend to read my review before reading the next one just to give a little refresh. Oh that’s a good idea! I should start doing that! You ended up finishing the book (in part because I convinced you, I know) but you even gave it three stars, which indicates you kinda liked it. So what DID you like? I felt like that standstill – or even backwards pedaling – was part of the plot. *shrugs* but I can see why that could make it a hard read. One of my favorite things about this series are the illustrations. I own book one in print and fully intend to own book 2 and 3 just so I can stare at the pictures. What do you think of them? How do they impact the story for you? The illustrations are my favorite part. 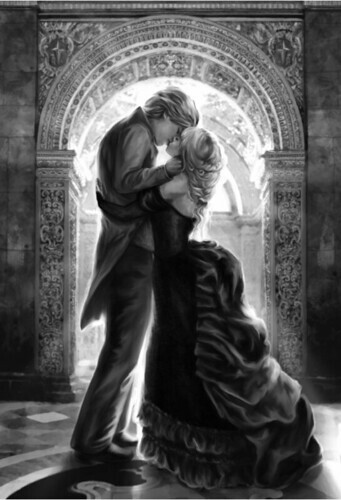 She is an amazing artist, I love how they give a face to the characters and the story, I LOVED this picture of El (I can’t remember how to spell her name lol) and Reon kissing. That was my favorite in this book like the picture of all 4 of them was my favorite in the first book. I remember that one – I had Selena send you a signed poster of it as a surprise. Kind of wish I’d asked her to send me one too, but I’m happy with my signed paperback So here’s the big question – there’s just 1 more book in the trilogy and you own it. Will you read it? If no- why not? If yes – When? I will read the next one only because of they way it ended and I do want to see where the next story takes the characters and how it ends. When will I read it? I don’t know, maybe soon but I need to be sure I am in the mood to read it since the slowness really got me in this book. It was another build up to the next book and you know how much I am not a fan of a build up book. And if you’ve read Hope’s Reign I’d love to know – Was it good for you? If not, are you interested in it? Fun chat! I have to admit it’s fun reading a chat when y’all don’t agree on liking the book. *ha* The artwork really is incredible and now I’m even more curious. Thanks for sharing y’all’s discussion. LOL! Well looks like you can pretty much count on Michelle and I to at least slightly disagree 😉 There’s like the perfect number of pictures too, placed perfectly! I hope you read it! I’m glad you’re convinced 😉 We have so much fun doing these – especially since our opinions are ALWAYS different. Even if we both like a book the reasons are usually way off. Keeps it fun! Already?!? COYER B2B is over!